The American Board of Dermatology (ABD) is restructuring the In-Training and Certification exams—moving from our current approach of emphasizing knowledge retention and visual diagnosis to exams that better emphasize the application of knowledge using clinically relevant case scenarios. 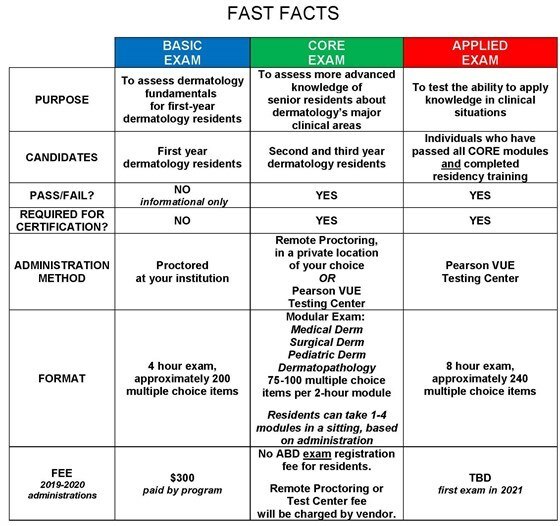 The Exam of the Future will be a staged evaluation with a BASIC exam designed for first-year residents, covering dermatology fundaments; CORE exam modules testing more advanced knowledge of senior residents about dermatology’s major clinical areas; and an APPLIED exam given after residency, which tests the ability to apply knowledge in clinical situations. This page serves as the Information Center to provide residents, program directors and program coordinators with the essential information about this new certification pathway. We will update it as new information and resources become available. Residents who began dermatology residency prior to 2018 will follow the traditional certification pathway, with the Certification Exam offered in July after their final year of training. Residents who began dermatology residency on or after July 1, 2018 will follow the new certification pathway, consisting of CORE modules throughout years 2 and 3 of dermatology training, followed by an APPLIED Exam at the conclusion of the final year. Refer to our NEW infographic for a visual overview of exam administrations by dermatology residency years. To help residents prepare for the new examinations, we created the reference materials listed below. Please note that content information may be updated periodically. The available documents are considered DRAFTS and further revisions are expected as the Exam of the Future evolves. Exam of the Future Content Overview To provide general guidelines about the content that may be evaluated in each exam. BASIC Exam Content Outline To provide an overview of the content assessed on the BASIC exam and the relative representation of each topic. CORE Exam Study Guide To list the types of content that may appear in the CORE modules. Sample Items To demonstrate the types of content on the BASIC, CORE and APPLIED Exams. When applying to take each exam, residents will be required to read and sign the American Board of Dermatology Honor Code. On Exam Day, they will be presented with the Honor Code again and asked to affirm their understanding and willingness to abide by its requirements. Click the table for a full resolution view. Will exam outlines be available beforehand? ABD will publish content outlines and sample items for the exams in order to help residents and programs prepare. How will the cost of this Exam differ from previous exams? ABD Directors are committed to making the Exam of the Future cost neutral for residents. For most, it will probably actually be less costly than the current certifying exam because travel to Tampa will not be needed. Why don’t residents pay an exam fee for the CORE modules? ABD does not want residents to have to pay fees earlier than they currently do, knowing that some graduate from medical school with significant debt. Thus, there are no exam fees for the CORE modules that are taken during residency. Residents are responsible for paying the proctoring fee to Pearson VUE and do pay a fee for the APPLIED exam. Why hasn’t the fee for the APPLIED exam been set? The fee for the 2021 APPLIED exam has not been set because all the costs are not yet known. Many functions related to exams are not performed by ABD but rather by vendors contracted with ABD. Exam items are written by physician volunteers, but there are many other steps involved in developing and delivering an exam. ABD must contract for management of the electronic item bank, editing, psychometrics quality control and scoring, electronic publishing of the exam, virtual dermatopathology, website software for exam registration and reporting, and proctoring. We do not yet have final quotes for all of these functions. Do residents have to pass the BASIC Exam? Residents do not have to pass the BASIC Exam. It is informational only. There is no pass/fail score. How do residents prepare for the BASIC exam? Learning from their clinical experiences, attending their program’s educational conferences, and using the BASIC Exam content outline as an aid in self-study. What if a resident hasn’t had a subspecialty rotation? Aren’t there questions about pediatrics, surgery, and pathology? There is a detailed content outline for the BASIC Exam that should facilitate self-study, and the level of difficulty is lower than that for the CORE or APPLIED Exams. A program director will take into consideration a resident's previous experience when evaluating scores. The BASIC Exam is not pass/fail and has no effect on a resident's standing at ABD. When are the CORE modules offered? The first opportunity to take the CORE is spring of the second year of dermatology residency. At that administration, candidates may take up to two modules. The CORE modules are offered three times during the third year of residency. In those administrations, candidates may take any number of modules they wish. In what order are the modules administered? Residents may take the modules in any order they choose. Are there basic science questions? Yes, the science underlying the clinical practice of dermatology is content that is tested. It is incorporated into each of the clinical modules. How long does it take to complete a CORE module? A CORE module is approximately 2 hours long. What is the cost to take the CORE Exam via Remote Proctoring vs. at a Test Center? The proctoring fees charged by our vendor, PearsonVUE, are available for reference here. What happens if a resident fails a module? Residents who fail a module more than the allowable number of times as a resident, may continue to take the module(s) after graduation from residency. Because passing the CORE is necessary to qualify for the APPLIED exam, they will not take the APPLIED until they have completed the CORE. They are considered Board Eligible because they have completed training. Their window of opportunity to become Board Certified is 5 years. What is meant by the term “remote proctoring”? Remote proctoring simply means that the proctor is not in the same room as the candidate. Typically, either the proctor watches by camera in real time or reviews video footage after the fact (“record and review”). Remote proctors are employed by the exam administration vendor, not the ABD. Why did the ABD decide to offer Remote Proctoring as an option for the CORE Exam? The American Board of Dermatology began offering Remote Proctoring to diplomates taking the Maintenance of Certification (MOC) Exam in 2014. This method of exam administration has proven to be highly secure while offering diplomates a convenient method for taking the exam. Travelling to a test center often requires diplomates to miss time in clinic and incur expenses associated with travelling to the nearest available test center, which could be in a distant metro area. When deciding how to best administer the CORE Exam to residents, security was a top priority. Minimizing the impact on clinic schedules and resident costs were also important factors. Remote Proctoring adequately addresses all considerations, allowing us to ensure the integrity of our exam content, confirm the identity of the test taker and monitor candidate activity during the exam, while also limiting resident absence from clinic and eliminating the need for residents to travel to distant testing sites. This exam administration method has been vetted and approved by the American Board of Medical Specialties for our CORE Exam. What are the technical requirements for taking an exam via Remote Proctor? The webcam and microphone capture candidate activity. A desktop recorder monitors activity on the computer, such as windows opened and keystrokes entered. Candidates are only permitted to leave the room during exam section breaks. After returning to the room, items from the prior exam section cannot be accessed. How can residents prepare for a seamless Remote Proctoring experience? In preparation for taking a remotely proctored exam, candidates will be instructed to perform a system check and take a sample test. Doing so allows candidates to resolve technical issues in advance of exam day. As our initial administration of the CORE Exam approaches, we will publish additional information about the process and provide links to a system check and sample test. What if a resident prefers to go to a test center? At this time, it appears that Pearson VUE will be our vendor for remote proctoring. Therefore, residents may have the option to take the exam at a Pearson VUE test center if they prefer. However, the proctoring fee may be higher at a test center than with remote proctoring. How do residents prepare for the APPLIED exam? Learning from clinical experiences and educational conferences, and reviewing content outlines for assistance with self-study. Reviewing clinical cases and challenging themselves to think through carefully the diagnosis and management options. It may also be helpful to review consensus and evidence-based practice guidelines. What advice can you give about how to answer these questions? Think about what a physician would actually do when treating the patient in real life, and answer the question accordingly. Do not try to second-guess what the ABD “wants” residents to answer. Do not assume a question that seems simple is actually complex or is a trick question. “Trick” questions are not psychometrically valid and should not appear on exams. Who decides what the correct answers are? In some cases, there is a strong evidence base to support particular choices. In other cases, there is not a sufficiently robust evidence base, and the correct responses are determined by consensus of experts. The ABD is committed to sharing information about the new exam process as it becomes available. To ensure you do not miss an important announcement, we will maintain an archive of all announcements in the table below.